File - Senate Majority Leader Mitch McConnell, R-Ky., joined at left by Sen. John Barrasso, R-Wyo., speaks to reporters in advance of President Donald Trump's State of the Union speech, on Capitol Hill in Washington, Tuesday, Feb. 5, 2019. 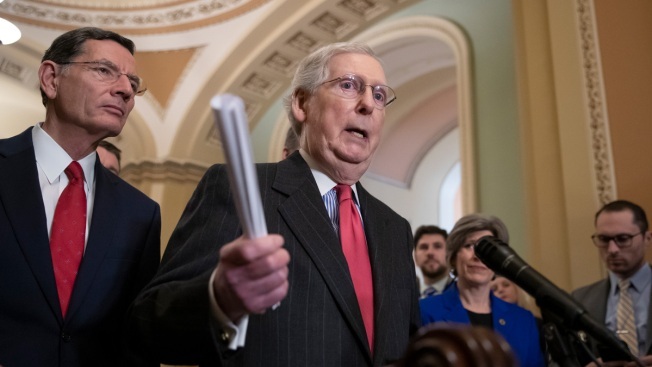 Senate Majority Leader Mitch McConnell, R-Ky., conceded Monday that he believes the upper chamber will vote this month to terminate the national emergency President Donald Trump declared at the U.S.-Mexico border, NBC News reported. “I think what is clear in the Senate is there will be enough votes to pass the resolution of disapproval which will then be vetoed by the president and then all likelihood the veto will be upheld in the House,” he said at a news conference in the Capitol.